Now that the weather is getting warmer (although I wish it would just stay warm and keep getting warmer! ), it is time to lighten up the meals a bit. 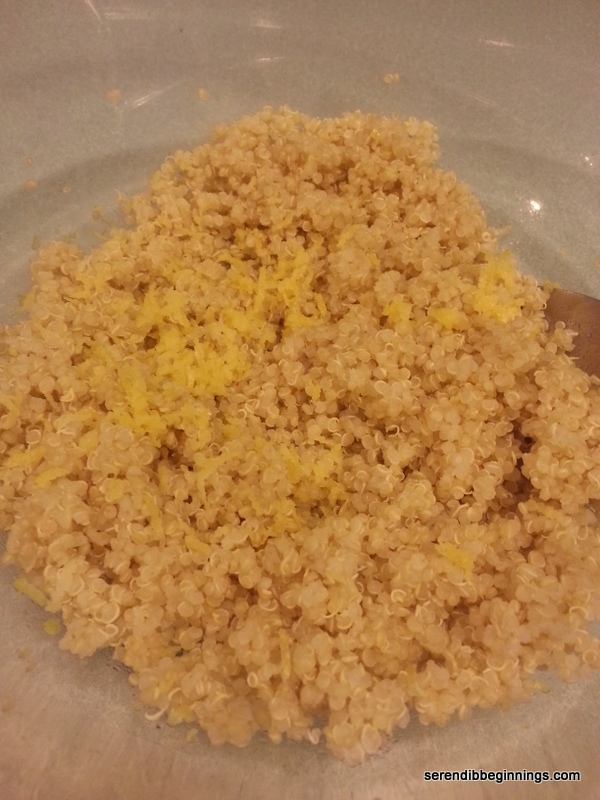 And so enters quinoa – again! 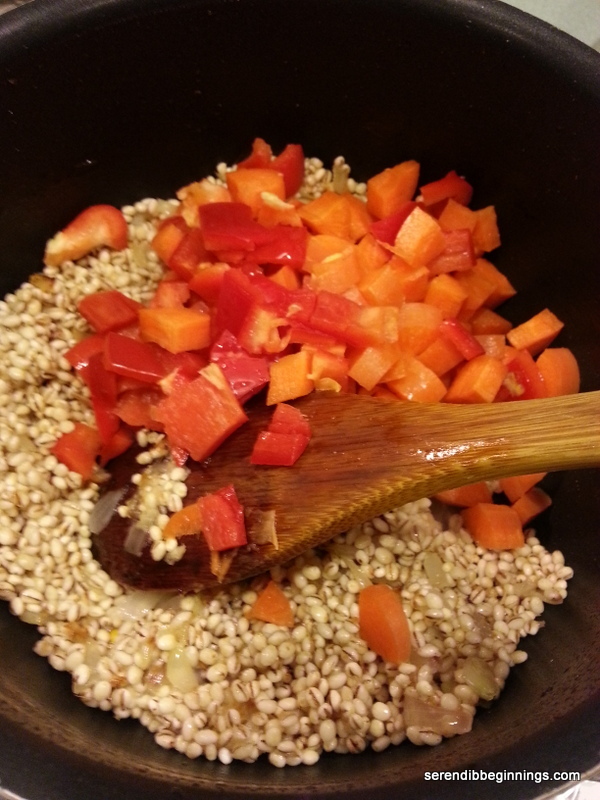 One of my earliest post is for a slightly different version of quinoa salad. This recipe inspired by a traditional tabbouleh using bulgar goes to show how versatile these little seeds are! Just have a container of cooked quinoa handy and you can make a salad, quinoa breakfast cereal or southwest quinoa patty in a jiffy. Although the veggies listed under ingredients are what I used for this batch, you can go crazy with your favorites. 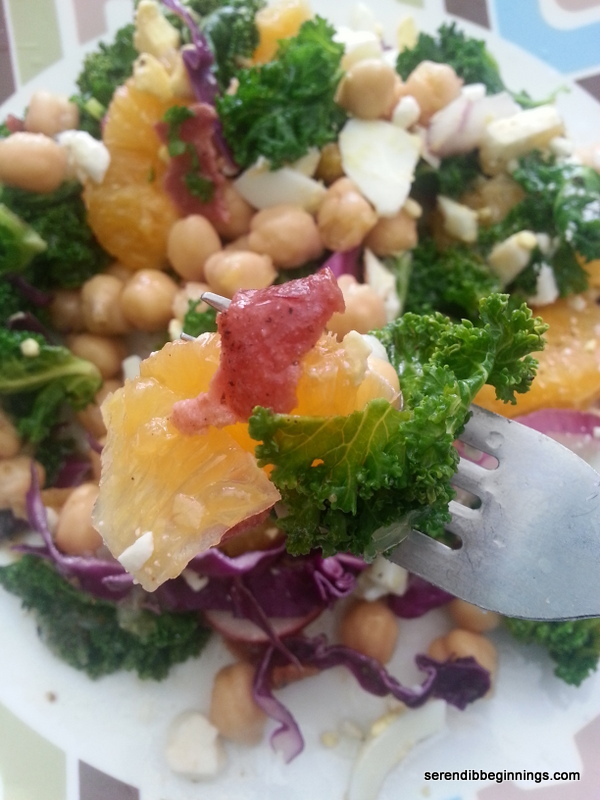 Chickpeas not only amp up the fiber content, but also make this salad more substantial – a plus in my opinion ‘cos that means you don’t have to rummage through the pantry for a snack soon after dinner. 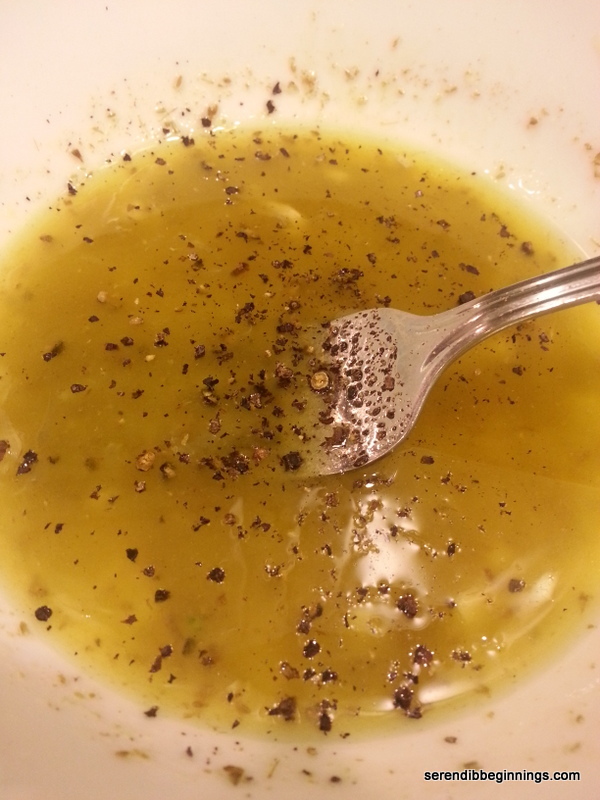 Dressing is very light and refreshing with lemon juice, garlic and a bit of ground cumin. So, what are you waiting for? 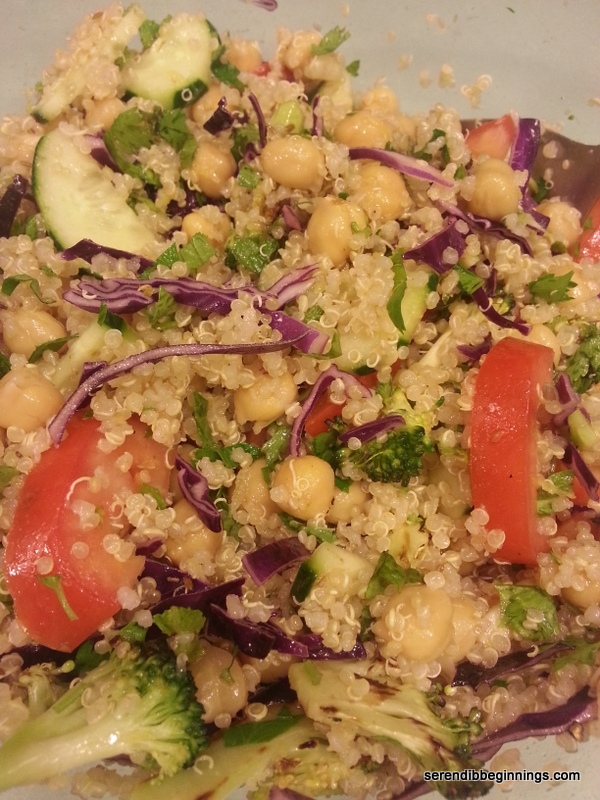 Grab a large bowl and start tossing in your favorite veggies and quinoa! 1. 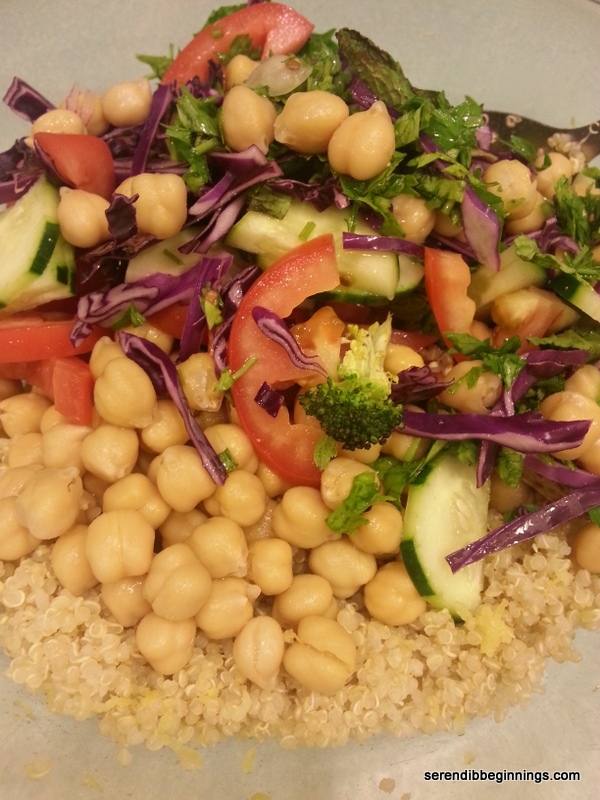 In a large bowl, combine quinoa, cut up vegetables, chickpeas, lemon zest and fresh herbs. I used broccoli florets, purple cabbage, cucumber and tomato. 2. 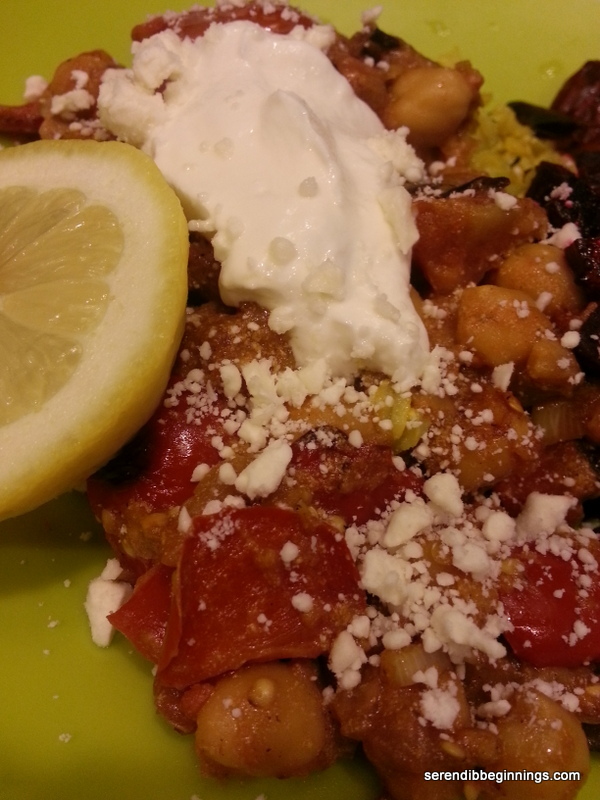 In a small bowl, combine lemon rest of the ingredients except pita halves. Whisk to make a dressing. 3. 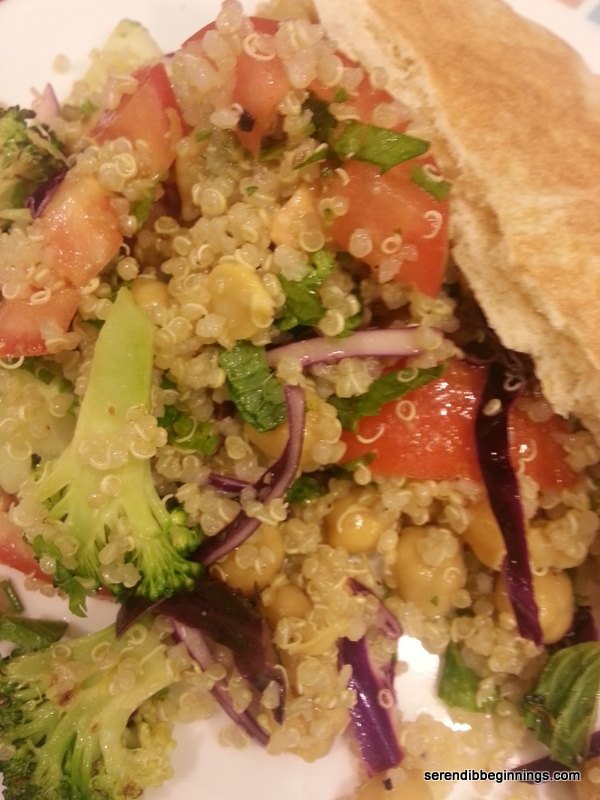 Pour the dressing over the quinoa and other “tabbouleh” ingredients and toss to combine. 4. Serve with a pita half or just by itself. Salad will keep refrigerated for next day’s lunch. TIP: Feel free to sauté the broccoli florets in a tablespoon of olive oil to develop the flavors. I had one of those days last week when I tried to bake couple of types of cookies and lost track of time. I realized I had no leftovers and had to quickly throw together something while one batch of cookies were baking with remaining dough chilling in the refrigerator. 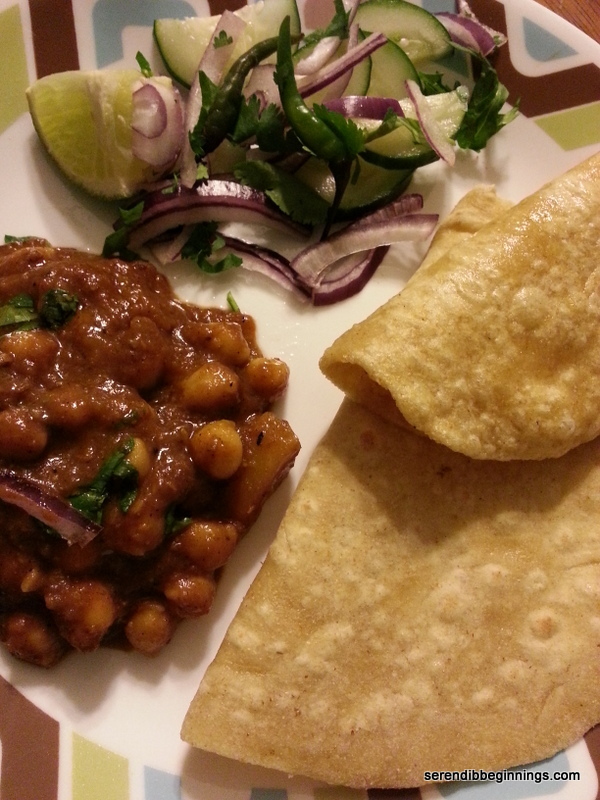 My conditions – our dinner had to be something nutritious, quick and vegetarian! A quick inventory of what I had on hand resulted in me laying out an eggplant, a red pepper, can of chickpeas (see, I didn’t lie when I said I try to have cans of beans around), red onion, couple of Roma tomatoes, non-fat plain Greek yogurt and a small can of tomato paste. Since I had some leftover dill rice, I thought of making a one-pot Greek-style sautéed veggies and beans. It was amazingly simple, quick, delicious and filling that I think I might actually plan on making this again. Try it topped with extra plain Greek yogurt for a nice touch! 1. Begin by preparing the vegetables. 2. Heat a non-stick frying pan over medium high heat. Add olive oil. 3. 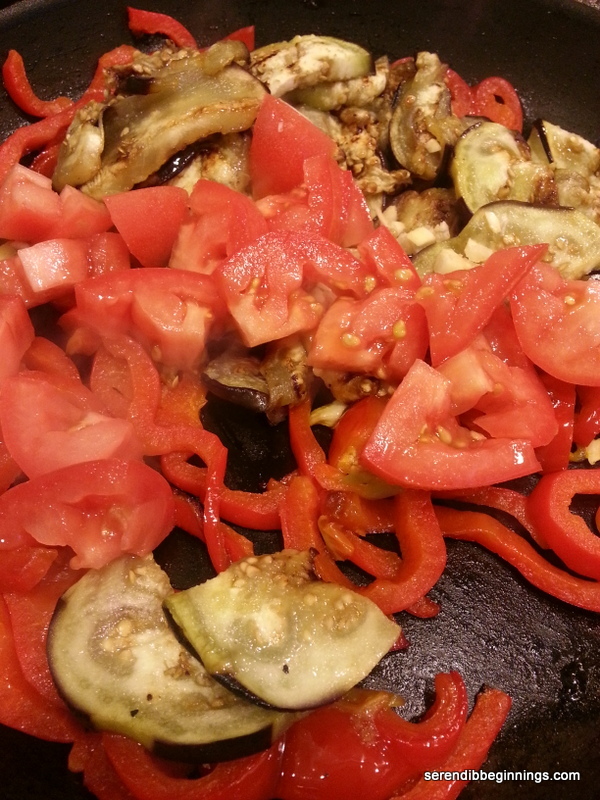 Add eggplant, red pepper and onions and sauté till lightly browned. Add garlic and continue to sauté for another minute. 4. Now add the tomato paste and ground cumin and cook for about 3 minutes. 5. 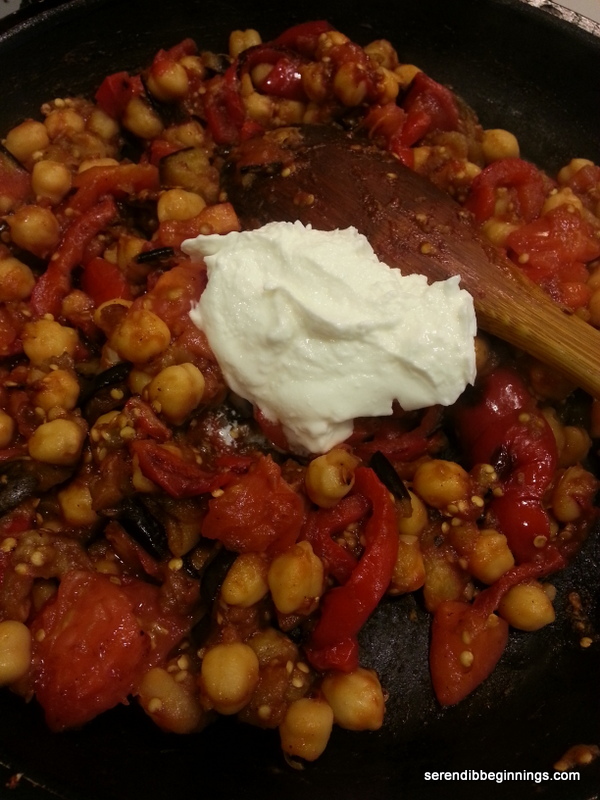 Add the chickpeas and Greek yogurt and stir to heat through. Remove from heat and serve with warmed pita or rice. You can “dress up” your meal with a small dollop of Greek yogurt, light spritz of fresh lemon juice and a sprinkling of feta cheese. 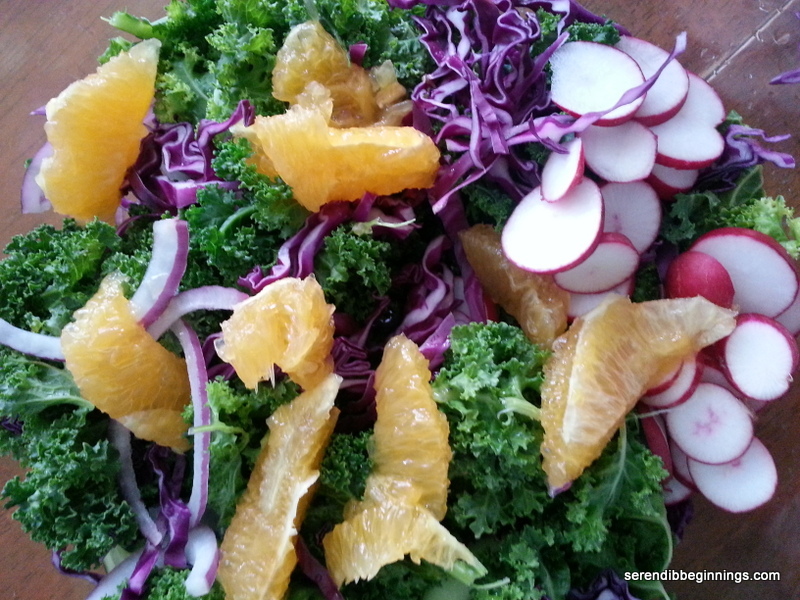 Green may not be my favorite color, but I love greens – the eating type! Spinach, collar, mustard, kale, turnip…When it comes to spinach and kale, I enjoy them in every which way. So, when it was time for a light and quick lunch over the weekend, I was motivated by my sister to prepare a kale salad. I had kale on hand along with bunch of salad-type veggies. 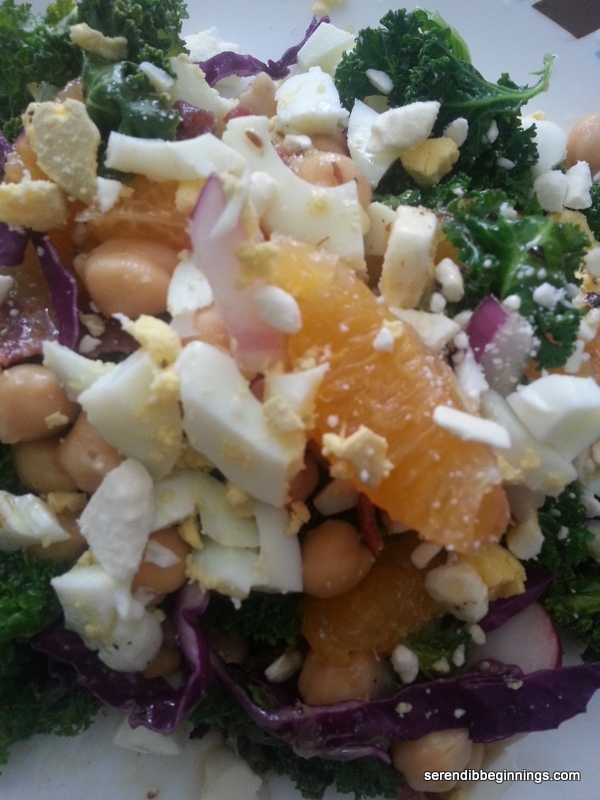 So, a quick look through the refrigerator and pantry resulted in me laying out kale, radish, red onions, purple cabbage, fresh orange, fresh lemon, canned chickpeas, feta cheese, leftover turkey bacon and boiled eggs! It’s gonna be delish! I have heard people complain about kale being difficult to digest. Although I haven’t found this to be an issue, I figured I will look into it. After a brief cyber consulting, I decided to do a flash-blanch of the leaves prior to preparing the salad. Briefly sautéing or blanching kale not only helps with easier digestion, but also softens its earthy, slightly bitter taste. Additionally, it also makes it easier to make kids eat it too! Feel free to add in any salad vegetables of your choice. 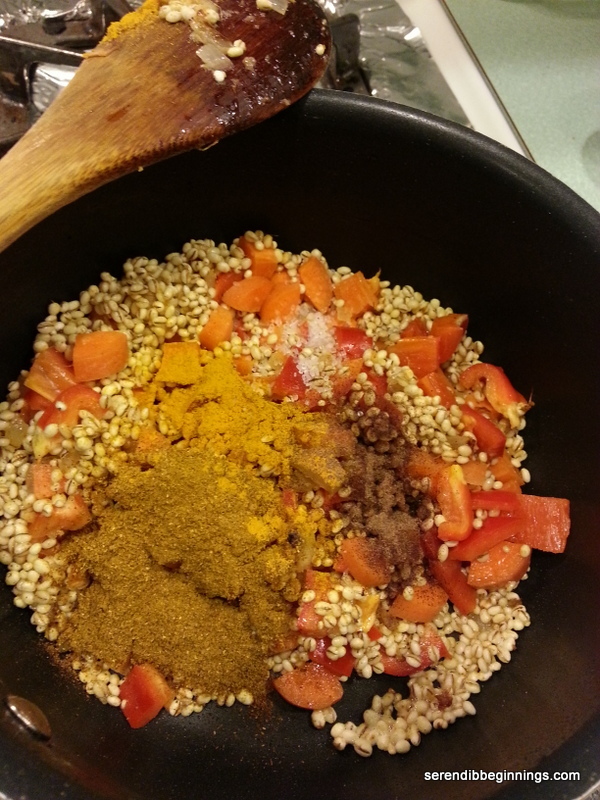 You can also add in cooked quinoa, barley or couscous in lieu of (or in addition to) the chickpeas. Similarly, replace boiled egg with grilled chicken breast or salmon. Let your creativity run wild – I guarantee you will enjoy the finished dish! 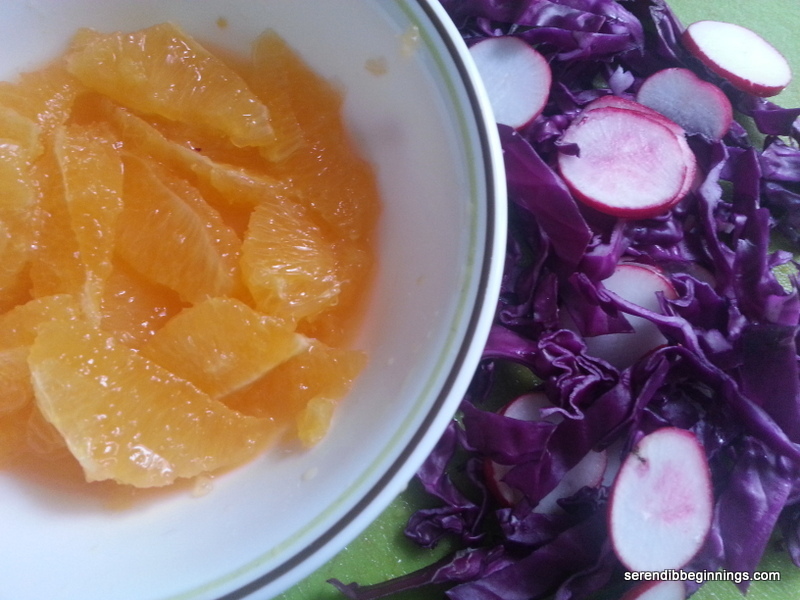 Lastly, I really think the quick salad dressing made using orange juice, lemon juice, olive oil, salt, pepper and dash of crushed cumin seeds is just perfect for this salad. Again, feel free to substitute another dressing of your choice. 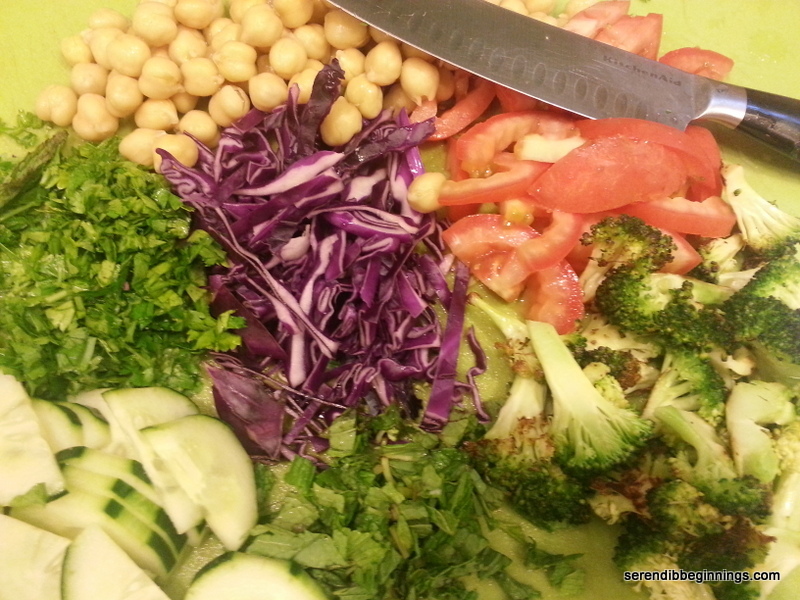 This salad is satisfying, delicious and packed with chock full of nutrients! Enjoy! 1. Blanch kale leaves very quickly by dropping them in boiling water and immediately removing them. You can transfer them to an ice-cold water bath, but I skipped this step. Transfer the drained leaves to a salad spinner and remove any remaining water. 2. Place the leaves in a large bowl. Add in remaining salad ingredients and toss to evenly distribute. 3. In a small bowl, whisk dressing ingredients thoroughly. 4. Drizzle over salad and serve immediately. I always try to have a can or two of chickpeas on hand. Yes, they are tastier and probably healthier if you soak and cook them in your own kitchen, but I always seem to need them on the spur of the moment. Hence, I usually stock my pantry with few cans of different types of beans. 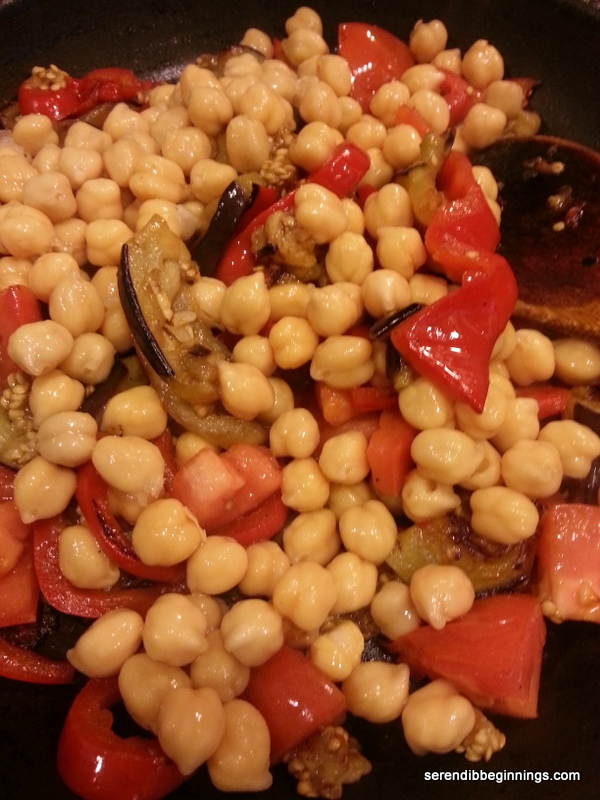 I use chickpeas in salads, mixed in with rice, tossed in chicken curry and in myriad other ways. One of the most common preparation is making a curry highlighting their simple, yet delicious taste and texture. 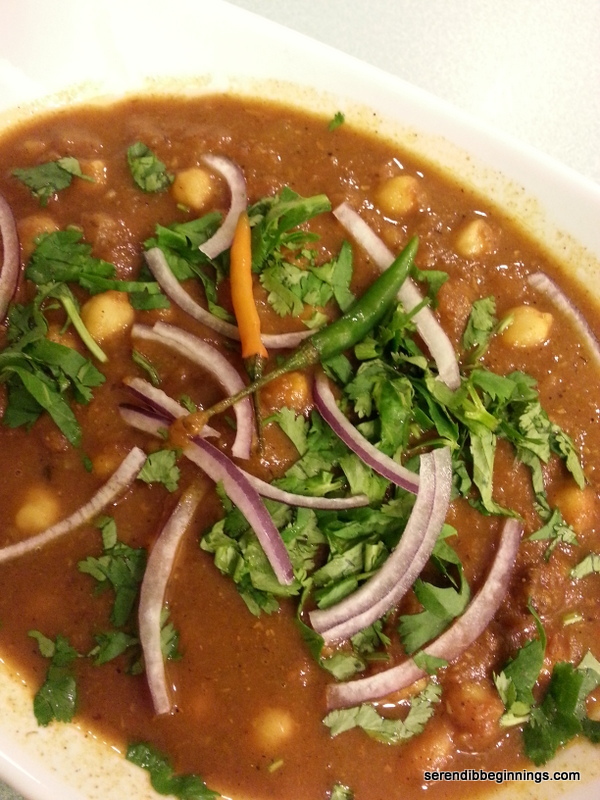 Chickpea curry can be prepared in many ways and it goes by different names – chole and channa masala being the most common. This particular recipe also uses some diced potato. Potato soaks up the flavors well without “stealing the thunder” from the chickpeas. Feel free to omit it if you want to just keep it all chickpeas. Taste will be unaltered. This dish can be served with steamed rice or any flat bread. Accompany it with a small crispy salad or sliced cucumbers and red onions with bit of lemon juice. 1. Heat oil in a medium wok or pan. 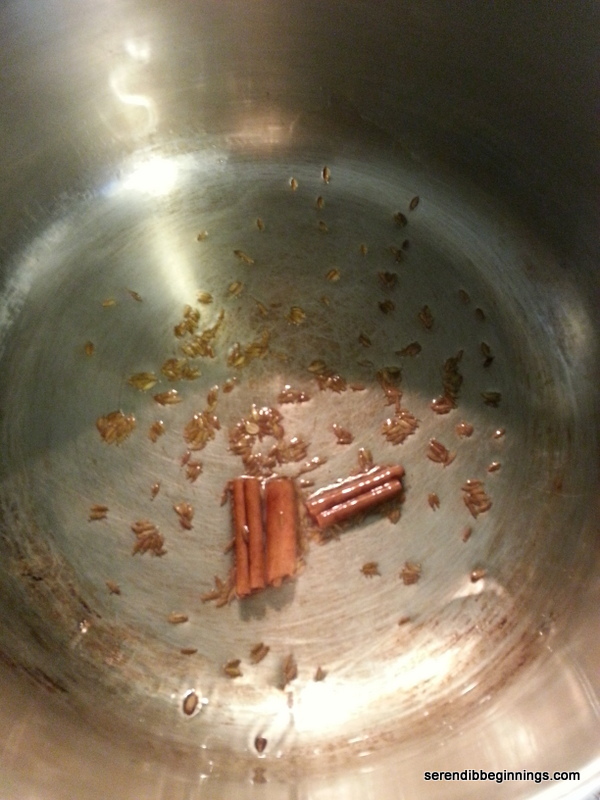 Sauté cinnamon and cumin for a minute under low medium flame. 2. 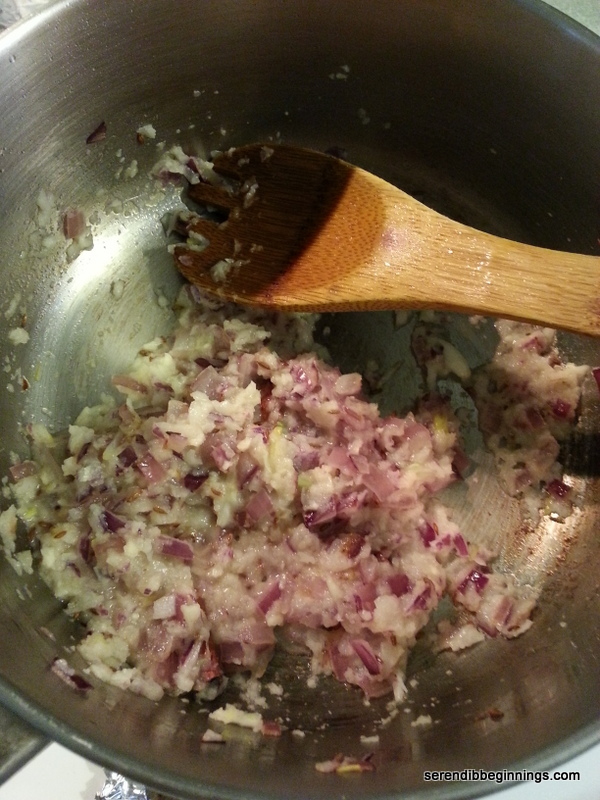 Increase heat to medium and add onions and ginger/garlic paste and sauté for 3-5 minutes. 3. 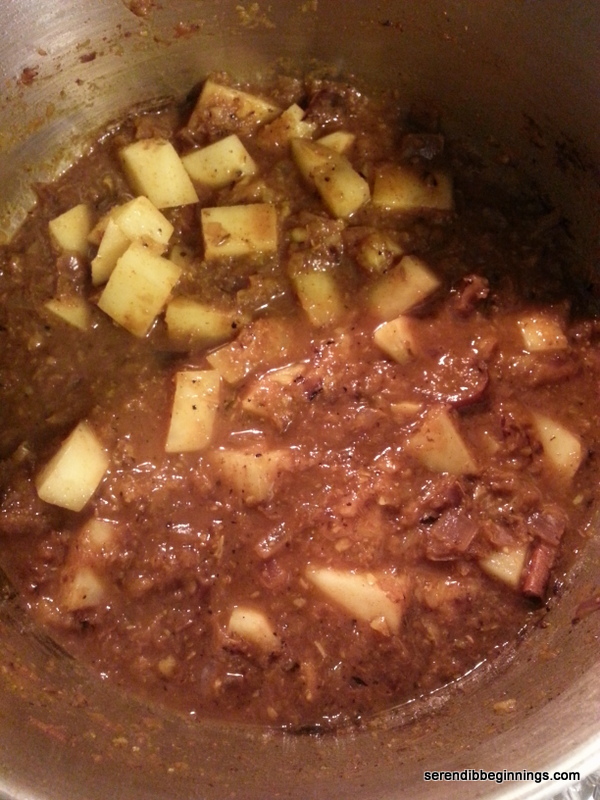 Add potato and continue to cook for another 3 – 4 minutes. 4. 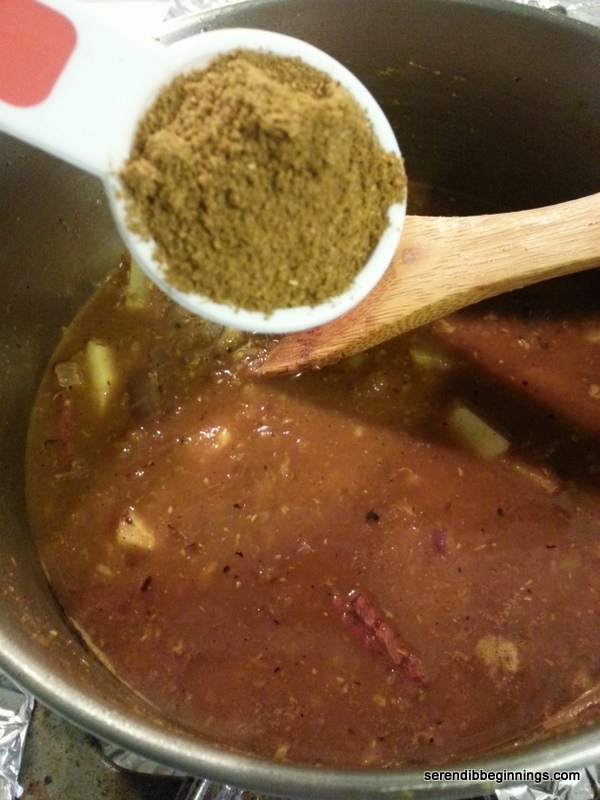 Stir in cayenne, tomato sauce, curry powder and water. Season with salt and cook for about 20 minutes, till potato is cooked through. 5. 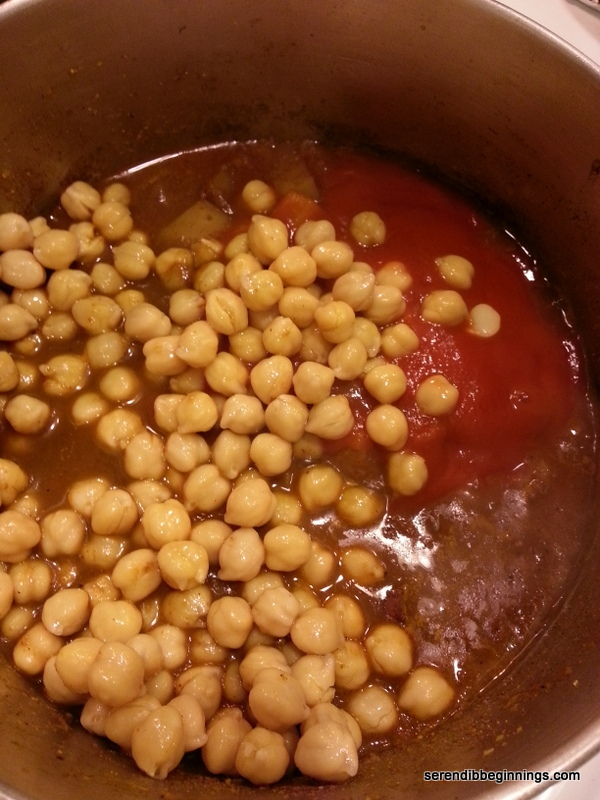 Add chickpeas and continue cooking till chickpeas are heated through and the sauce reaches the desired consistency. 6. Garnish with sliced onions, chopped cilantro and slices of lemon. 7. Serve hot with steamed rice or flat bread of your choice (like naan, roti, chappati or even pita bread). Let me be the first to admit I can’t remember the last time I cooked with barley. It is possible that I never did! Oh boy, am I glad I managed to bring some into my kitchen just couple of weeks ago! Barley is one of those grains that can be easily passed off in favor of others such as quinoa etc. However, with its delectable chewy texture, thickening properties and satisfying nature, I think it could definitely be one of the most promising grains out there. If you have never had it before and are wondering how it tastes, it tastes like tiny bits of cooked pasta, but perhaps a bit chewier. Definitely a pleasant taste and texture. 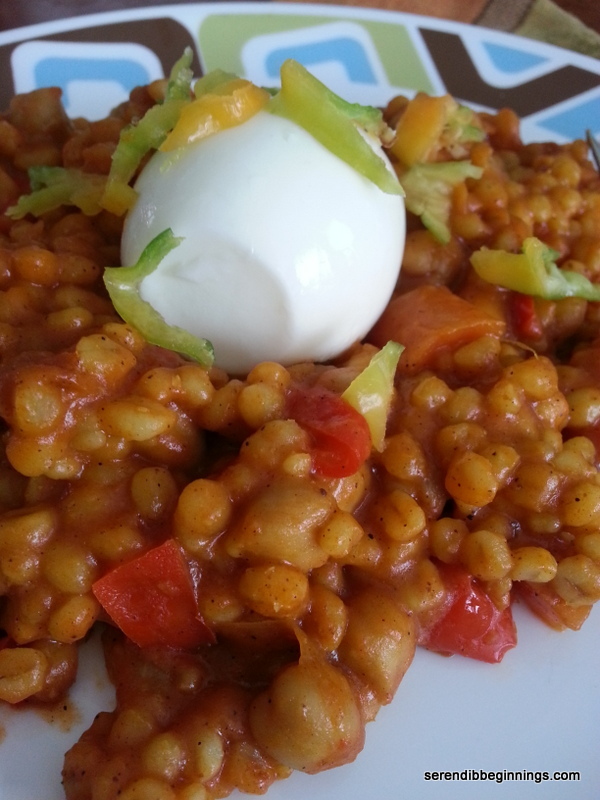 For my first attempt at preparing a vegetarian entrée using barley, I wanted something very flavorful and substantial, yet without much heaviness. A pilaf-style dish should fit the bill and that’s what I did. 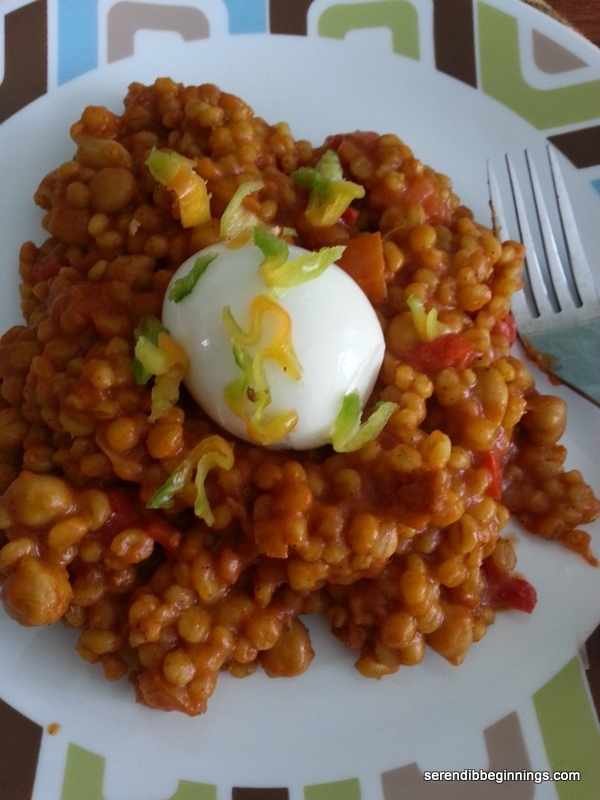 The end product was very satisfying, especially with the addition of chickpeas and was very flavorful with just the right amount of curry flavor. 1. Melt the butter in a medium pan over medium heat. 2. 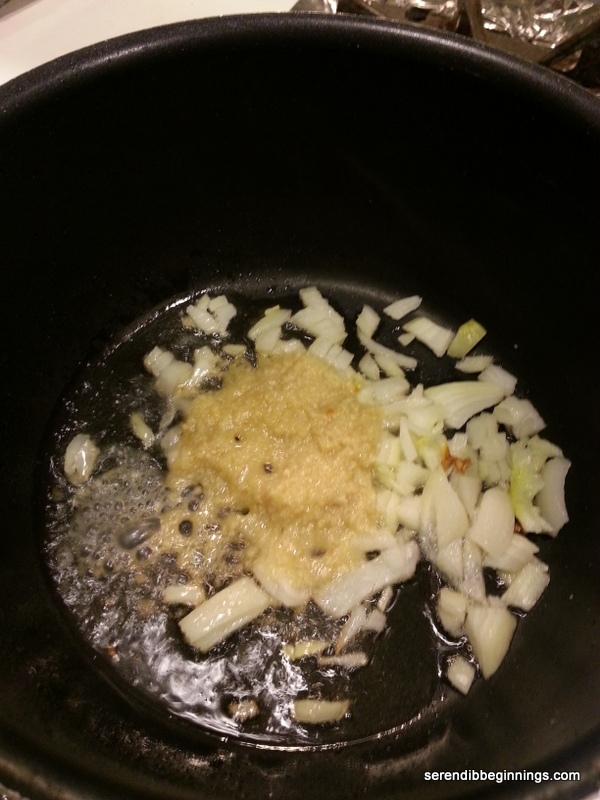 Sauté onions and ginger/garlic paste till onion turns translucent and starts to turn golden. 3. 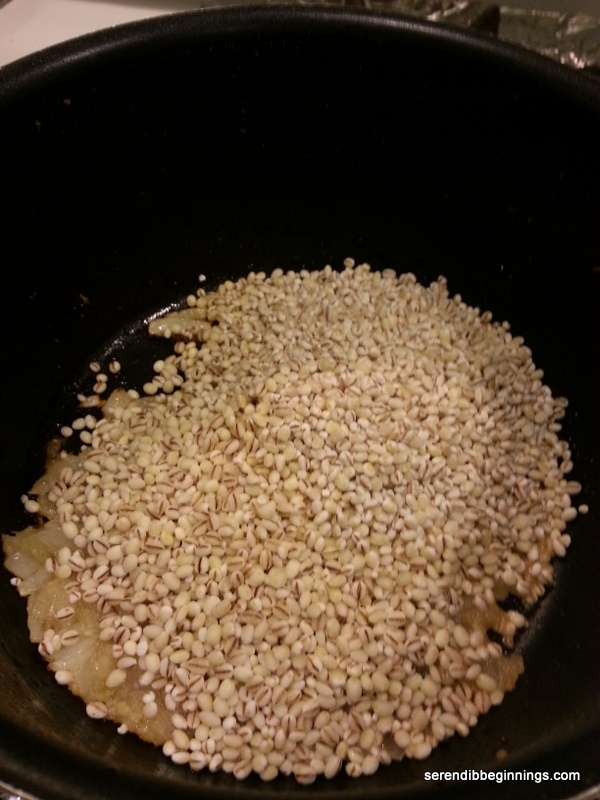 Add the barley (rinse barley before adding, if needed) and sauté for 2-3 minutes. 4. Add the vegetables and continue to cook for another 3 minutes. Now add the ground spices. 5. 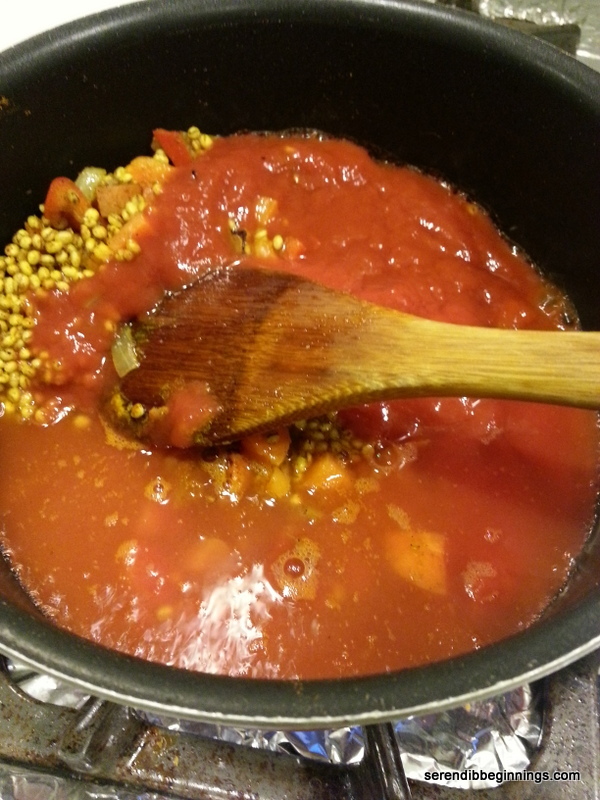 Stir in the tomato sauce, salt and water. Bring the mixture to boil, cover, reduce heat and cook for about 25-30 minutes till all the water is absorbed and the barley is fully cooked. 6. Finally, stir in the rinsed chickpeas and warm through for another 5 minutes. 7. Serve immediately. Leftovers can be refrigerated and reheated.